2010 TK7 is a sub-kilometer near-Earth asteroid and the first (and only) Earth trojan discovered to date; it precedes Earth in its orbit around the Sun. 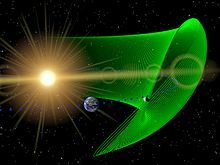 Trojan objects are most easily conceived as orbiting at a Lagrangian point, a dynamically stable location (where the combined gravitational force acts through the Sun's and Earth's barycenter) 60 degrees ahead of or behind a massive orbiting body, in a type of 1:1 orbital resonance. In reality, they oscillate (librate) around such a point. Such objects had previously been observed in the orbits of Mars, Jupiter, Neptune, and the Saturnian moons Tethys and Dione. 2010 TK7 has a diameter of about 300 meters (1,000 ft). Its path oscillates about the Sun–Earth L4 Lagrangian point (60 degrees ahead of Earth), shuttling between its closest approach to Earth and its closest approach to the L3 point (180 degrees from Earth). The asteroid was discovered in October 2010 by the NEOWISE team of astronomers using NASA's Wide-field Infrared Survey Explorer (WISE). WISE, a space telescope launched into Earth orbit in December 2009, imaged 2010 TK7 in October 2010 while carrying out a program to scan the entire sky from January 2010 to February 2011. Spotting an asteroid sharing Earth's orbit is normally difficult from the ground, because their potential locations are generally in the daytime sky. After follow-up work at the University of Hawaii and the Canada–France–Hawaii Telescope, its orbit was evaluated on 21 May 2011 and the trojan character of its motion was published in July 2011. The orbital information was published in the journal Nature by Paul Wiegert of the University of Western Ontario, Martin Connors of Athabasca University and Christian Veillet, the executive director of the Canada–France–Hawaii Telescope. 2010 TK7 has an absolute magnitude of luminosity (determinable because of its known location) of about 20.8. Based on an assumed albedo of 0.1, its estimated diameter is about 300 meters. No spectral data are yet available to shed light on its composition. 2010 TK7 would exert a surface gravitational force of less than 1/20,000 times that of Earth. At the time of discovery, the asteroid orbited the Sun with a period of 365.389 days, close to Earth's 365.256 days. As long as it remains in 1:1 resonance with Earth, its average period over long time intervals will exactly equal that of Earth. On its eccentric (e = 0.191) orbit, 2010 TK7's distance from the Sun varies annually from 0.81 AU to 1.19 AU. It orbits in a plane inclined about 21 degrees to the plane of the ecliptic. Trojans do not orbit right at Lagrangian points but oscillate in tadpole-shaped loops around them (as viewed in a corotating reference frame in which the planet and Lagrangian points are stationary); 2010 TK7 traverses its loop over a period of 395 years. [note 1] 2010 TK7's loop is so elongated that it sometimes travels nearly to the opposite side of the Sun with respect to Earth. Its movements do not bring it any closer to Earth than 20 million kilometers (12.4 million miles), which is more than 50 times the distance to the Moon. In 2010/2011, 2010 TK7 was at the near-Earth end of its tadpole, which facilitated its discovery. 2010 TK7's orbit has a chaotic character, making long-range predictions difficult. Prior to 500 AD, it may have been oscillating about the L5 Lagrangian point (60 degrees behind Earth), before jumping to L4 via L3. 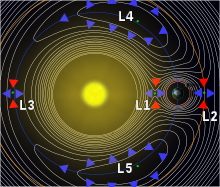 Short-term unstable libration about L3, and transitions to horseshoe orbits are also possible. Because Earth trojans share Earth's orbit and have little gravity of their own, less energy might be needed to reach them than the Moon, even though they are much more distant. However, 2010 TK7 is not an energetically attractive target for a space mission because of its orbital inclination: It moves so far above and below Earth's orbit that the required change in velocity for a spacecraft to match its trajectory coming from Earth's would be 9.4 km/s, whereas some other near-Earth asteroids require less than 4 km/s. During the 5 December 2012, Earth close approach of 0.197 AU (29,500,000 km; 18,300,000 mi), the asteroid had an apparent magnitude of about 21. ^ Because of its orbital inclination and eccentricity, 2010 TK7's position relative to Earth is actually a complicated, tightly coiled spiral; however, if its average position relative to Earth over a year is represented by a single point, that point will follow the tadpole loop. ^ a b "2010 TK7 Orbit". Minor Planet Center. Retrieved 1 September 2015. ^ a b c d "JPL Small-Body Database Browser: 2010 TK7" (2012-11-07 last obs). Retrieved 31 March 2016. ^ a b Choi, Charles Q. (27 July 2011). "First Asteroid Companion of Earth Discovered at Last". Space.com. Retrieved 27 July 2011. ^ a b c d e f g h Connors, Martin; Wiegert, Paul; Veillet, Christian (27 July 2011). "Earth's Trojan asteroid". Nature. 475 (7357): 481–483. Bibcode:2011Natur.475..481C. doi:10.1038/nature10233. PMID 21796207. Retrieved 27 July 2011. ^ "NASA's WISE Mission Finds First Trojan Asteroid Sharing Earth's Orbit". NASA. 27 July 2011. Retrieved 1 September 2015. ^ Keys, Sonia (7 October 2010). "MPEC 2010-T45 : 2010 TK7". IAU Minor Planet Center. Retrieved 31 July 2011. ^ a b "Earth's first Trojan asteroid: 2010 TK7". Astro.uwo.ca. 27 July 2011. Retrieved 1 September 2015. ^ "Found at last: First Earth companion asteroid". MSNBC. 27 July 2011. Archived from the original on 28 July 2011. Retrieved 28 July 2011. ^ "JPL Close-Approach Data: (2010 TK7)" (2011-08-03 last obs (arc=40 days; Uncertainty=2)). Retrieved 21 January 2012. ^ "AstDyS 2010TK7 Ephemerides for 2012". Department of Mathematics, University of Pisa, Italy. Retrieved 21 January 2012. Amos, Jonathan (28 July 2011). "Trojan asteroid seen in Earth's orbit by Wise telescope". BBC News. Retrieved 29 July 2011.